As I scour my tanks for details that need to be cleaned up, I figured I'd show how I solved tracks. Many folks have methods to paint tracks, and I am not entirely settled on one yet, but here's where I'm at so far. First, I put a layer of paint down that is a mix of leather brown and bronze. This gave what I felt was an accurate rust colour. Panthers had all-metal tracks, and while many folks like to paint the base colour oxide red (for the tank primer colour), any pictures I've found don't seem to. The mix of bronze and brown means the tracks have a slight metallic sheen, thinly mixed with the brown enough that it's not a consistent metal appearance. Next I drybrush with gunmetal. 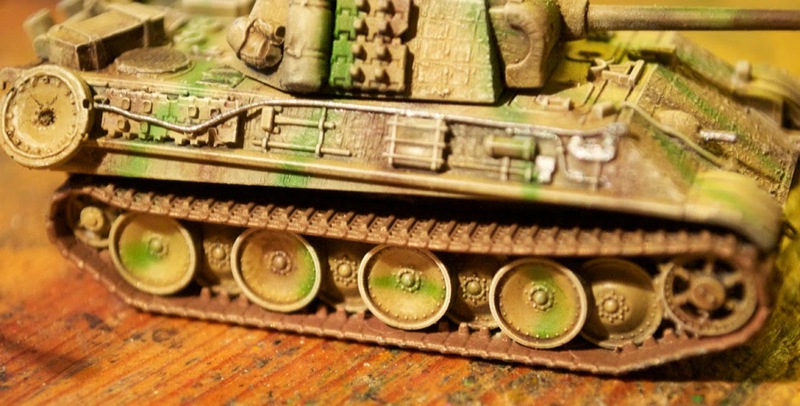 Even though the tracks would rust quickly, they would also be worn to a shine by friction on the edges, and if you want to go super-detailed (which I did on one or two tanks) wherever the wheels would rub against the inside of the track. If you are a fan of cleaner tracks, this is a fine place to stop, with a was that's 50/50 Vallejo matte black and GW's black ink. If you're like me though, having clean-looking tracks is anathema. Any tank that isn't in the factory is going to have mud everywhere. 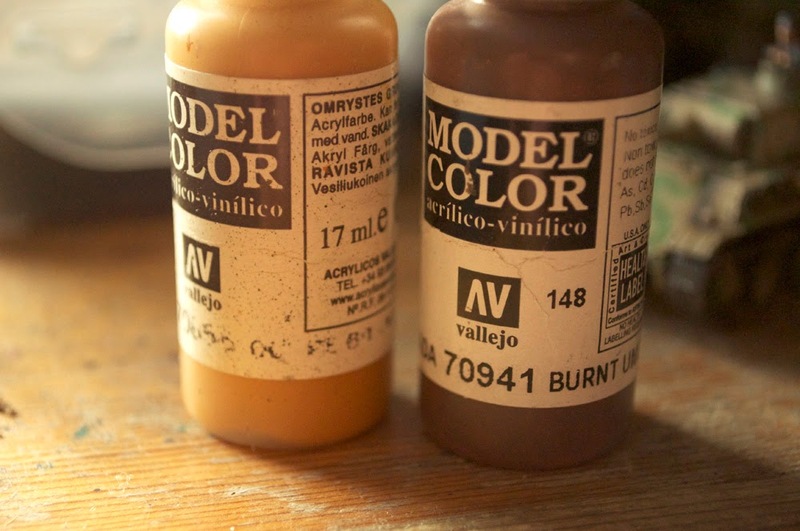 To achieve a good effect for this I mixed the paler brown (Light Ochre, I believe is the colour name, but to be honest, I've had it so long and the label is so degraded...) mixed with Burnt Umber roughly 50/50. Next I threw in sand. I tried to make sure it was the finest sand I could manage, but there are some slightly larger bits among. 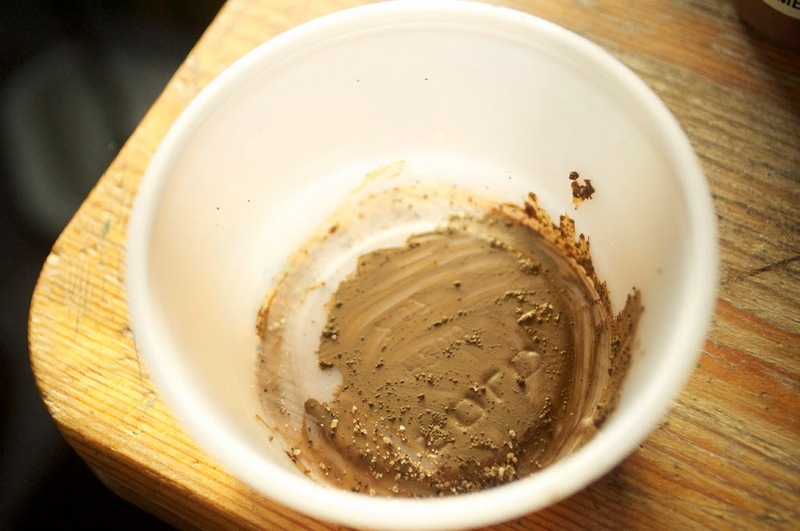 You want there to be just enough sand that when pulled with a brush it goes all non-newtonian solid, without being distinctly "brown painted sand clumps"
This is then dabbed along the base of the tracks inside first, since this would pick up a lot of grit. Since the PSC tracks have an odd casting mark on the inside of these tracks, it's a good place to hit with the dirt first, to cover or disguise those. Adding more, try to make the entire track bottom mucked up at least a little bit. Next, the back part of the track on the outside needs to be liberally splattered, as well as the lower half of the tank's rear hull plate. (Sadly, I don't have photos of those just yet.) Next, put small dabs along the upper track section, and a few at the front, which I've been using to hide the join of the tracks there. Here you can see a tank that has had its upper track pull quite a few clumps of mud from the ground. 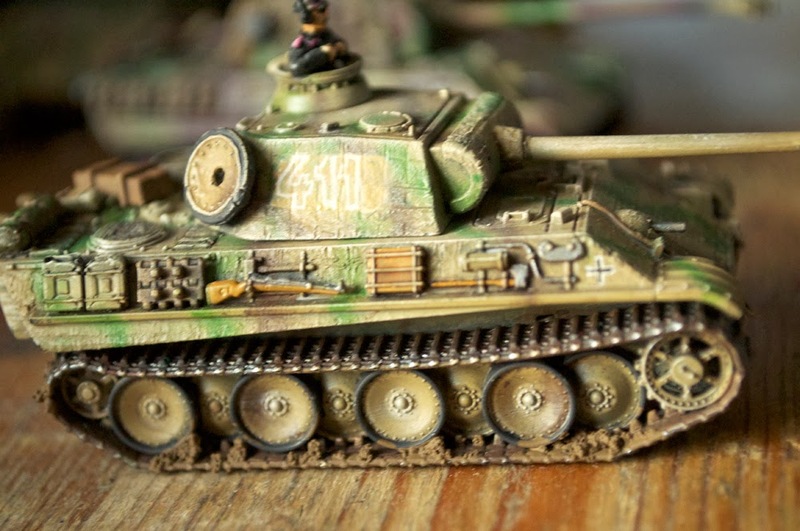 I will say one nuisance I have with the PSC Panther tanks is the wheel design. 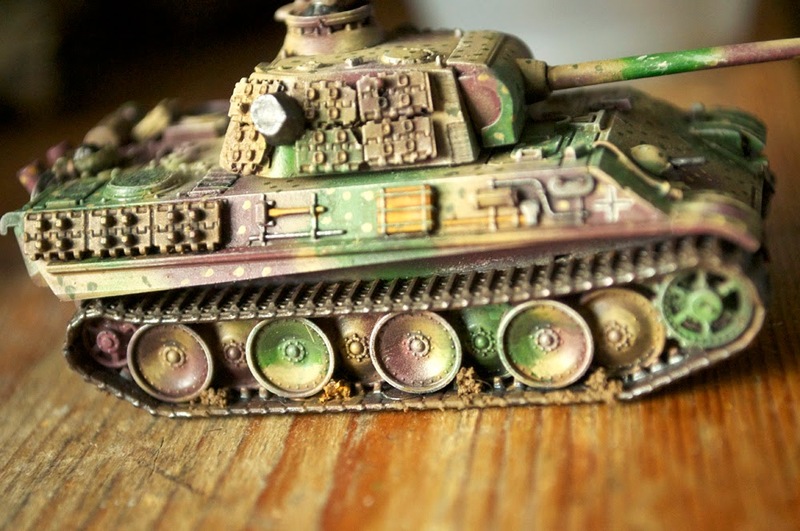 Unlike their newer Tiger tank, the Panther does not come with options for the solid steel wheels and the rubberized tires. What they do have is a version of the rubberized tires with incredibly thick edges, not quite accurate to the historical tank. As you can see above, I've been having a hard time debating whether to do the rubber in black, which looks odd, or standard tank colour, since it's not quite accurate anyway. The final stage will be to wash the mud with a dark brown, accentuating it. 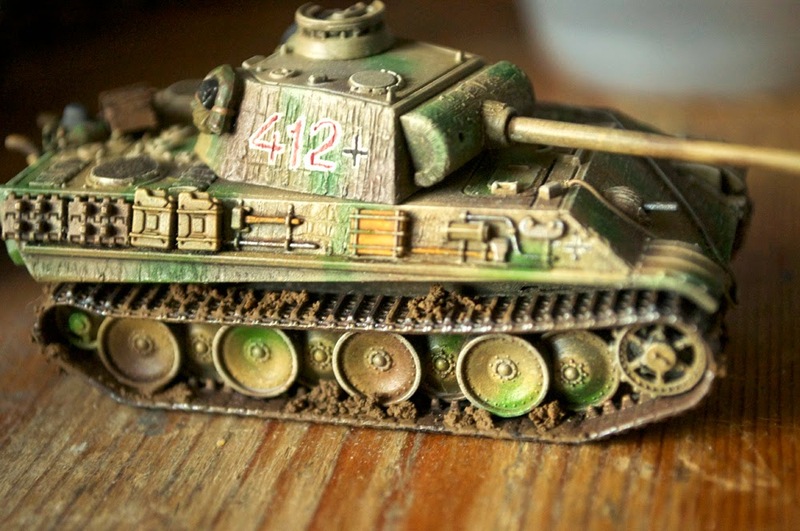 Otherwise, the tank company edges ever closer to entirely finished. I feel like I need to refine the way the balkenkreuzes are painted, and I have to scour each tank for details I've forgotten or don't quite like how they're finished. For the most part, the Panzer leaders are finished, and with a few more details they will be ready to command my forces! I am so eager to get these things off the painting desk and on to the battlefield!